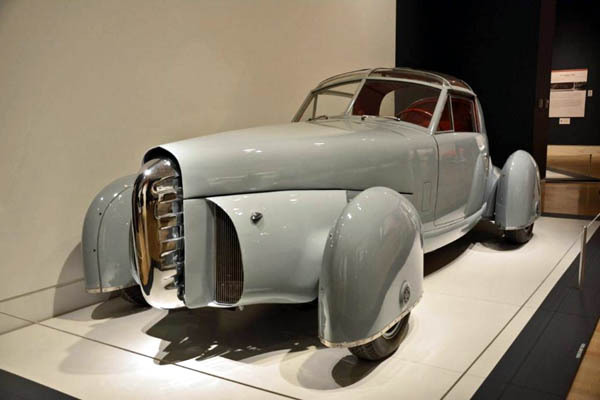 One of the most fascinating cars on display is the 1948 TASCO, an acronym that stands for The American Sports Car Company. Billed as the sports car of the future, the TASCO was designed by Gordon Buehrig, a man who worked as a designer for both Duesenberg and Cord, in a bid to convince the Beech Aircraft Company to build a science fiction-esque aircraft-inspired sports car. Design aside, the TASCO was highly innovative when it debuted, because it was crafted largely out of aluminum and it was the first car to use a T-top roof. Although few would have been surprised to look under the hood and see a Beechcraft engine, the TASCO was powered by a V-8 borrowed from the Oldsmobile parts bin.